The Ape Man prowled as a stealthy jaguar through the Guatemalan jungle. Ahead, the enemy agent Raglan had the Green Goddess idol containing a terrible weapon. Now that his friend D’Arnot has been freed, he had to lead his party to recover the idol and escape before the tribesmen attacked. I authored this for the Rochelle Wisoff-Fields photo writing challenge. The idea is to use the image above as an inspiration for creating a piece of flash fiction no more than 100 words long. My word count is 99. I could see the dilapidated hotel in the photo was the Hotel Henry Berrisford. 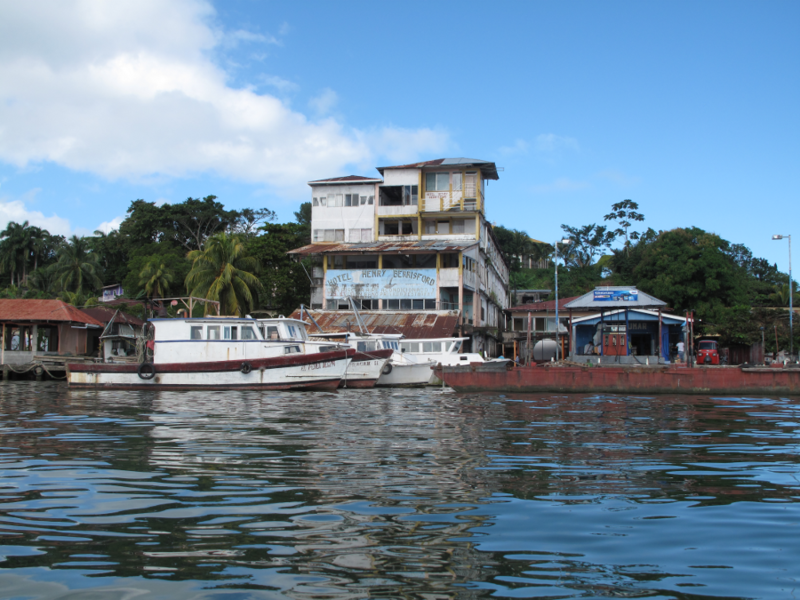 A quick Google search said it was located in Puerto Barrios, Guatemala. In looking at that Wikipedia page, I discovered one of the most interesting things about the place was that in 1935, the twelve-part movie serial The New Adventures of Tarzan starring Harold Brix (later known as Bruce Bennett) was filmed there. The serial was co-produced by Tarzan creator Edgar Rice Burroughs along with Aston Dearholt and George W. Stout, and Brix’s Tarzan, unlike most other film depictions up to that time, was more in keeping with the Tarzan in the novels, who was a cultured and well-educated gentleman. I’ve always been a Tarzan fan, so this bit of historical trivia was fun for me, though of course, the dialogue and much of the circumstances are fictional. The “Ed” mentioned is director Edward Kull. I just finished a Charles Portis book where the kids in a Belize neighborhood are all waiting a week to see a Tarzan movie, but after watching an hour of it they realize it’s not a Tarzan movie at all but Swamp Fire, one of the only non-Tarzan movies Johnny Weissmuller ever made. Portis gradually reveals this in hilarious fashion, first by implying that Tarzan has a Superman-like alter ego. Interesting. I remember Weissmuller playing the villain in a “Jungle Jim” movie and as a child, I was disappointed he wasn’t the hero. While I appreciate that you had to locate this in South America for the sake of the photo-caption writing challenge, Tarzan’s animal compatriots were all African species, and the setting was entirely African. D’ja ever try to say “Ungawa” to an elephant in Guatemala? [:0]. If you click on the link for the film in question, you’ll see it was not only filmed in Guatemala, but the story was set in that country. No error on my part this time, PL. And the Johnny Weismuller versions? No. They’re set in Africa as far as I can remember. I was referencing just this one 12-chapter serial filmed in 1935. After a hard day’s work in the jungle, a shower can be refreshing. Anita. Thanks. With most of his most popular books being written in the 19-teens and 1920s, I didn’t realize that Edgar Rice Burroughs had anything to do with the film industry. Very interesting. Neither did I, but maybe he had more creative control of the films in the early days, although it’s important to remember those old movie serials were shown one per week before the main feature and were usually filmed on a shoestring. Also, I checked, and Burroughs authored Tarzan books from 1912 to the late 1940s (he died in 1950). But no one did the Tarzan yell quite like Carol Burnette. That I didn’t know. I did know that for other Tarzan movies, the iconic Tarzan yell by Johnny Weissmuller was dubbed in. No one could do the yell like Johnny. When I was in Junior High and everyone else was working their way through the Tarzan book series, I was reading John Carter of Mars. Only a few years back did I pick up the very first Tarzan book at my local library and read it. Very different from any of the movies or TV shows. Haven’t had the opportunity to read subsequent novels. Great research and story. Really interesting. Good fun, I wonder if the hotel has changed much since 1935? In the photo, it looks rundown and deserted, so I can only imagine it’s changed quite a bit. Neither had I until I started researching, Lynn. Thanks. I always admire the results of your research, James, and this doesn’t disappoint. I wonder what took the film-makers to Guatemala? Beats me. Maybe it was cheap. Thanks, Penny. Wow that was an impressive amount of research going into this… but I can imagine Tarzan being filmed there. I’m sure various Tarzan films were made in lots of places, primarily in Hollywood backlots. That’s a nifty bit of detective work, James. It made me look at that crumbling place in quite a different light. I like it when details are recognizable in a photo and I can research the location. It gives me ideas that would never occur to me otherwise, Jane. I remember watching Tarzan for the first time in college…. and old black and white movie. I think I slept through most of it. LOL. I used to watch all those old movies on Sunday afternoon TV. It was great fun. I only had a hundred words to work with so I hope it wasn’t that complicated. Cool take! I’m not sure I ever saw this Tarzan, the one I most remember watching as a kid was the Johnny Weissmuller ones. This was a movie serial so chances are it never made it to television. Back in the 1930s through the early 1950s, before the main feature, theatres would show newsreels (before television, you could only see the news at the movies), cartoons, and a short, serial movie. This one was showed in “chapters,” one per week for twelve weeks. During the depression, it was one of the ways to get audiences to come to the movies on a regular basis. Television killed the old serials, alas. Yes, I’ve seen the old Flash Gordon serials. They used to show them on TV when I was little! Yeah, they’re a lot of fun, especially seeing how they tried to do the special effects on the cheap. The whole Star Trek: Voyager “Captain Proton” holodeck story arcs were a homage to those serials. Yes, I thought that while watching Paris and Kim’s favourite holo programme! Delightfully different take James – I too Googled it and even found a couple of good revues! Well done, and great research! And there I was, all tensed for the next exciting moment! I suppose you can have it in your imagination. It’s all part of a bygone era. Sometimes, I kind of miss it. Thanks, Prior. Thanks, Isadora. I don’t believe I’ve limited comments so it may be a glitch. I’ll look into it. I appreciate your comments. Ha, nicely done! I enjoy your stories not just for their inventiveness, but for the facts I learn along the way. You certainly do your research! Thanks, Spaceman. The research seems to add a bit of authenticity to what otherwise is a wholly fictional tale. There’s always something new to learn from my fellow fictioneers. Today, you taught me something new.